First mix feta cheese, parsley leaves, black pepper and one egg to make the stuffing. Then beat eggs and flour lightly to make the coating batter. Cut eggplant in circles or diagonals to 1/5" (1/2 cm.) thick slices with every two slice joined at one side. 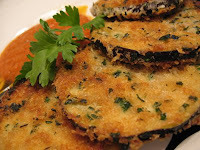 Stuff eggplants with cheese mixture and press two slices with your palms to make the cheese stick to the eggplant. When all the eggplant slices are stuffed, heat one cup oil in a frying pan. Dip eggplants in the batter, coat well. Fry 3-4 at a time until both sides are golden brown. Take to a plate lined with couple of layers of paper towel to drain excess oil. Lastly serve warm.